Archeologists authenticate 2,000 year old burial box of Miriam, daughter of Yeshua son of High Priest Caiaphas. The High Priest known as Caiaphas was an adversary of Jesus (Yeshua) and played a key role in his crucifixion, according to the Christian bible. The Yeshua mentioned in the ossuary is not to be confused with the Christian bible’s Jesus, as the name was a common Jewish one at the time. The Israel Antiquities Authority says the ossuary was seized from tomb robbers three years ago. 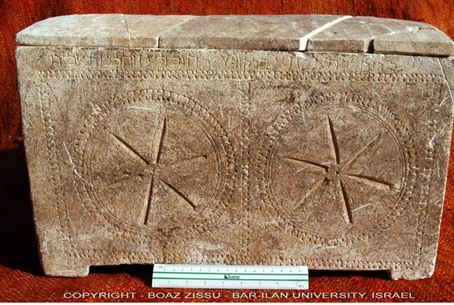 It is believed to have been taken from a burial site in the Valley of Ela in Judea. The IAA says in Wednesday's statement that microscopic tests have confirmed the inscription is "genuine and ancient." The IAA turned over the ossuary to Dr. Boaz Zissu of the Department of Archaeology and Land of Israel Studies at Bar Ilan University, and Prof. Yuval Goren of the Archaeology and Ancient Near Eastern Cultures at Tel Aviv University. The two scientists used ESEM/EDS (Environmental Scanning Electron Microscope / Energy-Dispersive Spectrometer) technology to verify the ossuary’s authenticity. They presented the results of their study in this week’s Israel Exploration Journal (Issue 61). Jews used ossuaries for secondary burial of the deceased from the late first century BCE until the early second century CE. Miriam Bat Yeshua’s ossuary has a stylized floral design on its front and the inscription is in Aramaic, in Hebrew lettering. Profs. Zissu and Goren and the IAA see the main importance of the ossuary in the connection it makes between the deceased, Miriam, and a family of priests from the Order of Ma’azya of Beit Imri. They note that it was High Priest Yehosef Bar Caiapha who was involved in the trial and crucifixion of Jesus. The archaeologists explain that Ma’azya (or Ma’azyahu) is the name of the last of 24 Priestly orders that served the Temple in Jerusalem. The names of the orders are listed in Chronicles 1 (24,18) and Ma’azya is mentioned in the Book of Nechemya (10,9). The ossuary teaches us that the Caiapha family belonged to the Order of Ma’azya. The scholars offer two possible explanations for “Beit Imri,” which means literally “the House of Imri.” One possibility is that this is a Priestly family’s name – the Imer family which is mentioned in Ezra (2:36,37) and Nechemya (7:39-42) – and that the Ma’azya Order were their descendants. The second option is that Beit Imri is a place name. In that case it is most likely the Judean village which now is populated by Arabs and known as Beit Umar. Second Temple Jewish remains have been found in that village and at Hirbet Kufin, nearby.